As promised, here is the third release related to Chris Christie and 2016. Last week we talked about his overall ratings as governor, and yesterday we looked at Hillary Clinton as a presidential candidate, finding she would currently trounce Christie in NJ. Today we look specifically at the governor as a presidential candidate. Full text of the release follows. Click here for a PDF of the release with text, questions, and tables. NEW BRUNSWICK, N.J. – As Gov. Chris Christie prepares for a 2016 presidential run in the midst of declining ratings at home, 59 percent of New Jersey voters say he would not make a good president, according to a new Rutgers-Eagleton Poll. Just 34 percent believe Christie would do well in the Oval Office. Voters’ views on a Christie presidency are also shaped by perceptions that the governor is lacking in qualifications to become commander-in-chief. Thirty-seven percent say he has the right “look” to be president, 36 percent say he has the right “demeanor and personality,” and 45 percent say he has the right amount of “experience” when considered against other potential Republican contenders. Voters in the Garden State are now more likely than ever – at 68 percent, up 13 points from December – to say Christie’s positions on issues, and his decisions on whether to sign or veto bills, are more about a potential presidential run than what is best for New Jersey. Just 22 percent feel he is putting the state first. Half of voters also say Christie’s travel schedule hurts his ability to be an effective governor, while 44 percent say it does not. Despite this, voters are evenly split on whether Christie will become the 2016 GOP nominee. Thirteen percent say this is very likely while 36 percent think it is somewhat likely. Another 49 percent think it is either somewhat unlikely (27 percent) or not at all likely (22 percent). While respondents offered more than 200 one-word or one-phrase descriptions of the governor, a few words were offered repeatedly. 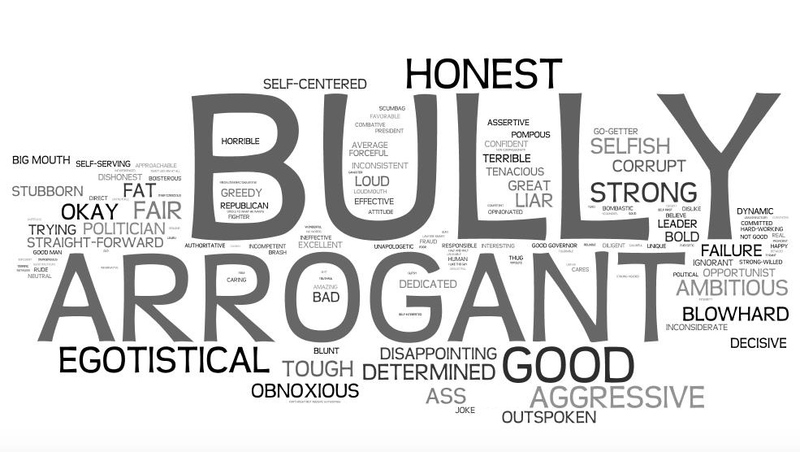 Ten percent used the word bully and more than 7 percent said arrogant. At 4 percent, good was the most popular positive word given. Bully comes to mind for a sizable share of Democrats (15 percent) and independents (9 percent). Arrogant is second with both, and selfish is not far behind. But not all their top adjectives are bad news for the governor: “good” actually ranks third among Democrats. Republicans are more varied in their responses. Honest is first (4 percent) while other positives (excellent, fair, good, strong) and some negatives (aggressive, arrogant, selfish) are each named by 3 percent. Overall, Republicans are less consistent than Democrats in the words they use. As with Christie’s gubernatorial ratings, views on a potential “President Christie” are much more positive among his base than they are among Democrats or even independents. But Christie support among the New Jersey GOP does not match the intensity with which independents and Democrats rally around Hillary Clinton. The 72 percent of Republicans who say Christie would make a good president falls well short of the 89 percent of Democrats who say the same about Clinton. Also, only 19 percent of Democrats see Christie as a good president, but 27 percent of Republicans think this about Clinton. More importantly, just 28 percent of independents say Christie would be a good president, far from the 60 percent of this group who back Clinton in the same scenario. Voters give Christie lukewarm scores in terms of a potential presidency, with the majority holding a negative outlook, as opposed to the exceedingly positive one they give Clinton. Even GOP intensity for their governor is not as strong as Democrats’ for Clinton. Fifty-eight percent of Republican voters say Christie has the right “look” to be president, just eight points higher than their percentage for Clinton. Twenty-seven percent of Democrats and 36 percent of independents feel the same about Christie – much lower than their thoughts on his potential Democratic opponent. Sixty-two percent of Republican voters, 20 percent of Democrats, and 36 percent of independents say Christie has the right demeanor and personality for the top job. While GOP views are much higher in this area than they are for Clinton, independents and especially Democrats are far less positive here for Christie. As for experience, Republican views on Christie (at 62 percent) are virtually the same as on Clinton. Three in 10 Democrats feel Christie has enough experience, while independents are more split on his credentials. Voters have grown increasingly negative about Christie’s views, actions, and time spent out of state the last several months, believing ulterior presidential motives are behind his decisions. Christie’s national focus has not gone unnoticed, even among his base. Republicans are now split over whether Christie’s recent words and deeds been about what is best for the Garden State or for his own presidential run. Forty-five percent of Republicans say his decision are about New Jersey, down 12 points since December. Nearly as many, 43 percent, think Christie is making decisions with his eyes on the White House, up 16 points. Just 12 percent of Democrats believe Christie is doing what is best for New Jersey; 82 percent do not. Independents’ views of Christie’s motivations are also negative: 20 percent think he’s acting for the state versus 68 percent who say decisions are about a presidential run. Opinions are similarly divided over how Christie’s travel schedule affects his ability to govern: 67 percent of Republicans say his frequent trips have no effect (down seven points), but 52 percent of independents – up 10 points, reaching a majority for the first time – and 60 percent of Democrats (up eight points) say it has hurt his ability to govern effectively.